2010 NFL Predictions: Buffalo Bills Odds to Win the Super Bowl: With a non-productive 2010 NFL predictions season in store for the Buffalo Bills you have to wonder why they will even showup at all. According to the Vegas odds, the Buffalo Bills to win the Super Bowl, they are a huge longshot with 100/1 NFL betting odds. But could the new coaching staff in Buffalo turn things around for the Bills. In short the NFL odds makers think not. The Buffalo Bills open the 2010 NFL schedule with a preseason NFL predictions matchup against the Washington Redskins on Friday the 13th. Oh, isn't that scary? It will be interesting to see if the new coaching staff is able to coax a passing game out of the lack-luster Trent Edwards. Edwards has not returned to normal ever since that concussion in 2008 and is only an average quarterback when putting it in the air. 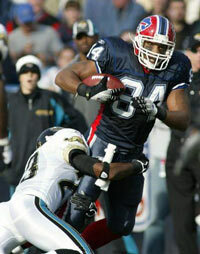 On defense the Buffalo Bills will be switching up the scheme under new defensive coordinator George Edwards. Edwards is set to install a new 3-4 scheme for the Bills this season. If I were to make a one of my 2010 NFL predictions on the Buffalo Bills, I would have to place them fourth in the AFC East. If your going to go against the grain and make your 2010 NFL predictions on the Buffalo Bills you can head over to BetUS.com. The NFL odds makers there are offering a FREE $250 deposit bonus. Lord knows you will need the extra cash.